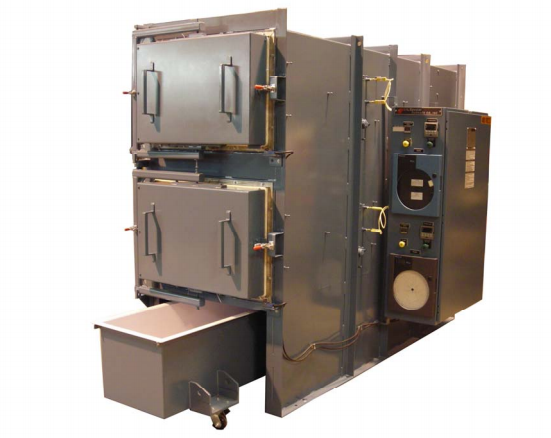 High Uniformity, Dual Chamber Box Furnace - L&L Special Furnace Co, Inc.
L&L Special Furnace Co., Inc. has manufactured a high uniformity, dual chamber box furnace used for solution heat treating of aluminum components and subassemblies for the aerospace industry. The dual chamber model DCA was supplied to a major airline repair facility located in the southeastern US. The furnace is complete with a pyrometry package in accordance with AMS2750E specifications. It includes thermocouple reference ports located within 2” of each control and over temperature thermocouple. Ports in corner locations are used to place thermocouples to record the hot and cold temperatures as indicated by the most recent thermocouple uniformity survey. The bottom chamber is a high temperature chamber designed to operate at 400-1,100ºF, and is primarily used for solution heat treating and annealing. The top chamber is designed to operate at 200-500ºF for aluminum aging. A rollaway quench tank is located under the furnace, which allows for quickly quenching loads in water. Loads for solution heat treating are placed on the furnace floor or in a customized basket. When the cycle is complete, an alarm sounds to notify the operator. The door is then opened and the parts are manually quenched in the quench tank located in front of the furnace (typical quench time is less than three seconds). Loads for annealing are placed in the bottom chamber and held at the required temperature for the required amount of time. Loads for aging are performed in a similar manner in the top chamber. The primary controls are UDC3200 program controls, and there are UDC1200 over temperature protection systems with backup contactors for both chambers. Each chamber has an alarm to notify the operator that the cycle is complete. The top chamber features a Honeywell DR450AT single input circular chart recorder. The bottom chamber is equipped with a dual input DR450AT circular chart recorder. This allows for the recording of the bottom chamber and quench tank temperatures. Each chamber has three thermocouples, one for temperature control, one for over temperature control and one for recording temperatures. The quench tank has one type J thermocouple for recording the temperature of the quench solution. The furnaces have a work envelope of 18” wide by 12” high by 72” deep. There are other sizes available.